ST. GEORGE – Set up near the waters’ edge at Sand Hollow Reservoir for the Ironman 70.3 is a large, 50-bed medical tent manned by federal, state and local EMS personnel. 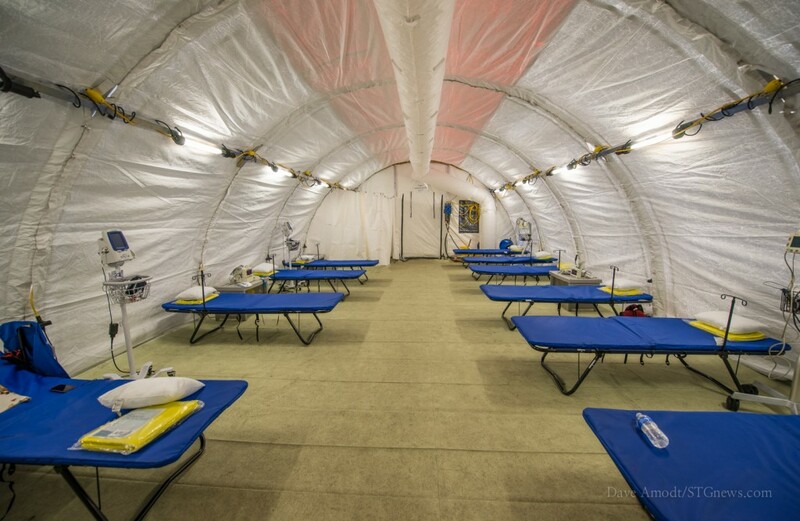 While the temporary medical facility is set to treat possible cases of hypothermia and exhaustion on the part of the Ironman swimmers, it is also a place where training meets application. Set up by the boat ramp where the swimmers will start and finish the watery portion of the Ironman event, Dan Camp, public information officer for the Utah Bureau of Emergency Medical Services and Preparedness, said the facility is comprised of two of four units spread across the state. The two units that were deployed for the Ironman 70.3 are from St. George and Tremonton, Camp said. Additional units are kept at Salt Lake City and Moab. Nine support trailers are also kept throughout the state. 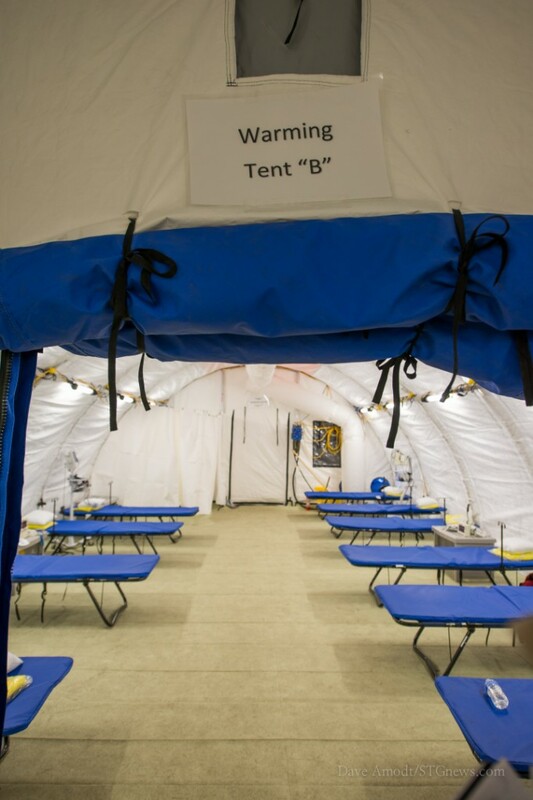 Camp said a reason why the medical resources are spread across the state is because “it’s easier to move people instead of equipment.” It also ensures that, if one tent or support trailer is lost in a disaster, resources are still available elsewhere. The medical tent has been set up at the Ironman events in Southern Utah for the last four years. Camp said that at the first year Ironman, medical staff treated around six swimmers for hypothermia. During the 2012 competition however, due to the winds that caused rough waters for the swimmers, 116 swimmers flooded the tent. One of the potential uses for the facility is to help avoid patient congestion in local hospitals during an emergency, or when the hospital itself may need to be evacuated in whole or in part. 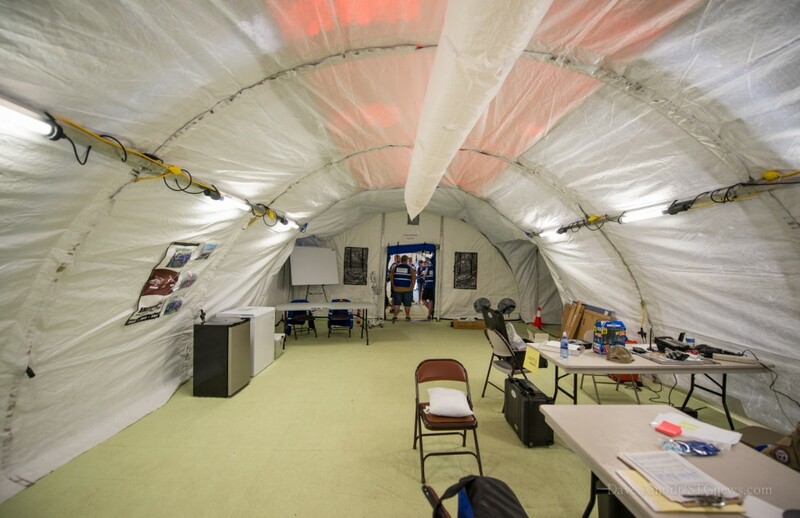 Thus far, the tents have primarily been utilized at planned events, Camp said, which allow for the continual training of medical staff who hail from local, state, and even federal-level agencies. It also provides for the application of that training in cases like last year’s shivering and exhausted Ironman swimmers. 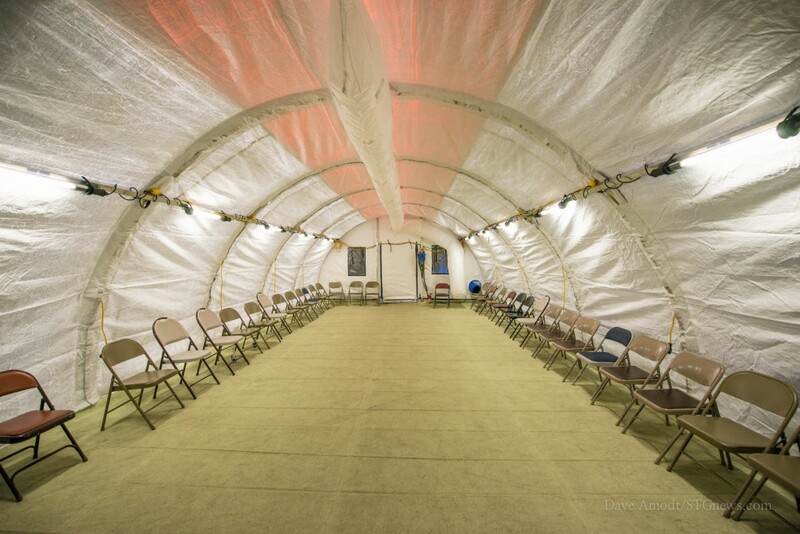 Multiple agencies and individuals are involved in staffing the tents. 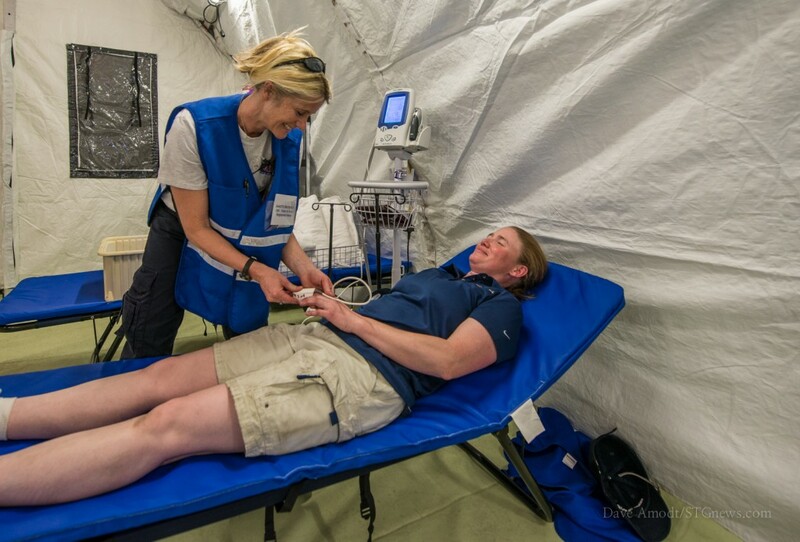 Examples of the different teams inlcude local medical practitioners who belong to a medical reserve corps located in Utah’s southwest region as well as a Veterans Affairs team that helps provide security and a group from Primary Children’s Hospital, among others. A federal-level agency involved in Ironman 70.3 at St. George for the first time is the Utah Disaster Medical Assistance Team. “We have different teams and they work out so well,” Camp said. Camp said BEMSP has been watching things since the Boston Marathon bombings. However, thanks to how security has been handled in the past and is being dealt with now, he wasn’t too concerned. 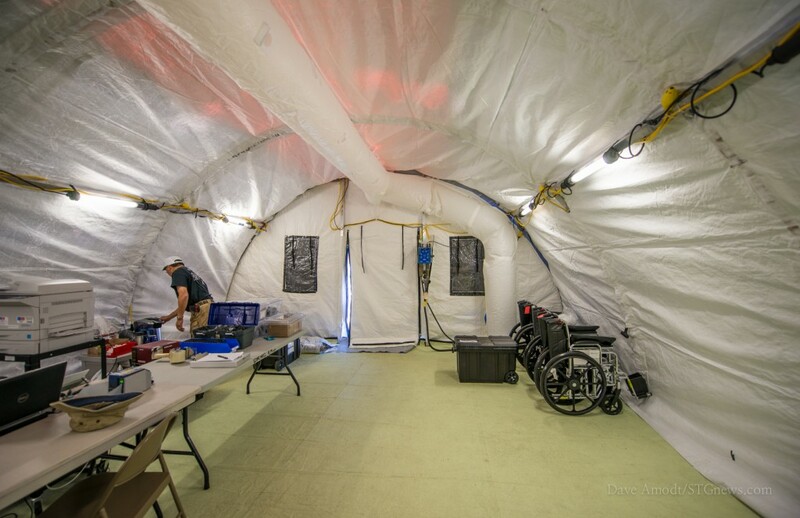 Camp said it takes about two hours to build a two-tent medical unit. Building a larger 100-bed unit takes between three and four hours. When tearing down the medical tent, someone is assigned to watch and make sure everything is put back in the right trailers, in the right way. The trailers need to be balanced for travel, Camp said, and having heavy equipment out of place – like the generator or A/C units – could have unwanted consequences while in transit. The fiscal support the medical response teams get for staging at planned events is not funded by the state, but rather by federal grants. “It’s not state taxpayer money,” Camp said. The entire cost for covering the Ironman 70.3 is an estimated $15,000, he said, and added that sequestration hasn’t yet affected their funding. “We’ve been lucky,” Camp said.